One of the most searched for swords is “The Last Samurai” katana replica, from the popular 2003 blockbuster hit featuring Tom Cruise and Ken Watanabe. Cruise portrays an American officer Nathan Algren, who finds himself with the samurai in 19th Century Japan. The film’s plot was inspired by the 1877 Satsuma Rebellion led by Saigō Takamori, and on the westernization of Japan by colonial powers, though this is largely attributed to the United States in the film for American audiences. The Last Samurai was well received by critics and it’s hard to find anyone who hasn’t watched the movie and liked it. The katana that Tom Cruise wields in the movie has quickly become one of the most sought after samurai swords for various collectors. There’s a couple of different “The Last Samurai” katana you can get. The first one below is a low quality replica from the film which can be used as a decorative sword. I wouldn’t recommend trying to cut anything with it as the sword isn’t full tang and the blade is very weak. Low-quality replica of "The Last Samurai" katana with a sword stand, costing $45. This sword is good for decoration (you also get a stand), but as I mentioned don’t try to use it for any cutting. If you’re looking for a much better replica, see below. High quality hand-made replica, costs less than $100. Masahiro Last Samurai katana an amazing hand forged replica of the sword used by Captain Nathan Algren (Tom Cruise). The 28″ blade is hand crafted from 1065 high carbon steel in the sinogi zukui shape. The shinogi-ji (blade ridge) has a tri-polish mirror finish for a unique look. The blade has been engraved with the same kanji as seen in the movie (“I belong to the warrior in whom the old ways have joined the new”). Measuring 10.5 inches the tsuka (handle) is real ray skin wrapped in a Japanese silk wrapping that is black in color. Housing the blade is a black lacquer finished saya (scabbard) that has a match black sageo as that of the tsuka. Done in a black metal, the tsuba (guard) is simple yet when matched with this katana an elegant design. Includes a black cotton sword bag and is 40 inches in overall length. 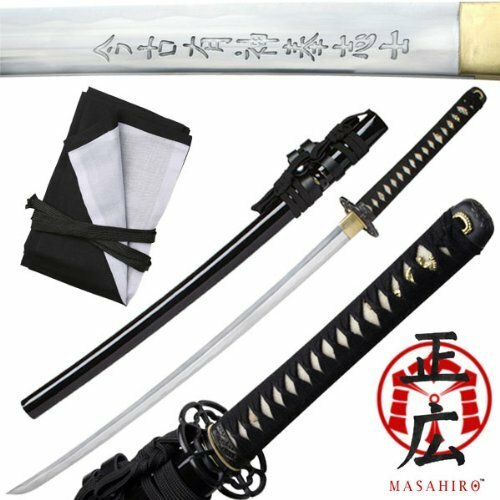 I really recommend getting the Masahiro replica: it’s a bit more expensive but it’s always nice knowing your sword is not only a low-quality decorative one. You can purchase it here, and I’m sure you’ll be pleased with the sword.